Every evangelical has a story about the moment he first glimpsed his destiny. Tulsi Tanti has two. The first came with his electricity bill, back in 1995. The young engineer's fledgling textile company, Suzlon, was just starting to take off. His new line of polyester yarns was doing well, but India's shaky power grid and the rising cost of electricity offset any profits. "We were constantly innovating, but we weren't able to control the price of power," says Tanti, now 49. So he decided to generate his own. After a few years of research, he settled on wind power, buying two turbines to provide his energy needs. The initial cost was steep, but the company, headquartered in the western Indian city of Pune, was no longer buffeted by the seesawing cost of fossil fuels. Soon Tanti was preaching to fellow industrialists about the economic advantages of staying off the grid. Epiphany No. 2: In early 2000, the inveterate traveler read a report on global warming predicting that without a radical decrease in the world's carbon emissions, some of his favorite tourist destinations, including the Maldives, would be under water by 2050. It was then that Tanti realized his fate lay far beyond the latest advances in synthetic fibers. "I had a very clear vision," he says. "If Indians start consuming power like the Americans, the world will run out of resources. Either you stop India from developing, or you find some alternate solution." 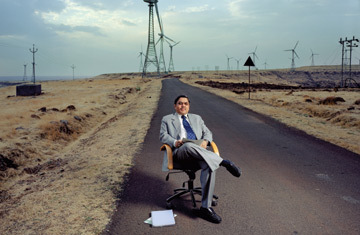 If wind was the answer to Suzlon's energy needs, asked Tanti, then why couldn't it fuel the growth of other industries? By 2001 Suzlon had sold off its textile manufacturing and plunged into the relatively new field of wind-turbine generators. Today, with factories on four continents and wind farms across Asia, Suzlon is the fourth largest wind-turbine maker in the world, with annual revenues of $850 million. With the price of oil hovering around $80 a barrel, Tanti is all the more convinced that wind is the energy of the future, and that Suzlon will help launch the industry into the mainstream. "Yes, green business is good business," says Tanti. "But it's not just about making money. It's about being responsible." Suzlon's main factory, in the southeastern city of Pondicherry, runs exclusively on wind power. Rainwater is collected to tend the lush grounds, and factory construction disturbed not a single tree. Tanti doesn't leave his mission at the office when he goes home to his three-bedroom apartment at night. "I could have a mansion and afford to leave the lights on all day long if I wanted. But it's not about saving money anymore for me. I just want to do what I can to fix the problem." And perhaps prevent his favorite island getaway from disappearing under water.